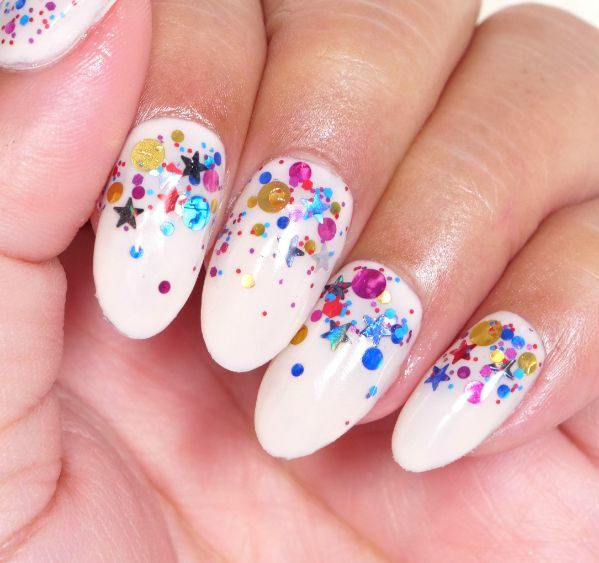 Confetti nails are the latest manicure trend and one of the most fun. The best part of this trend is that it is open to individual interpretation. With so many options for color, shape, and placement, this look offers opportunity for versatility and customization. Confetti nails can be worn to match an outfit, complement an accessory, or make a statement. What better way to celebrate than with a party at your fingertips? This iteration pops against a neutral manicure and looks as if confetti is exploding from the nail bed. The splash of color and design is electric while tasteful due to a harmonious color palette. Have fun and get creative playing with different party themes! 1. Prep nails for manicure as needed. This includes clipping, filing, pushing back the cuticles, and swabbing the nail with rubbing alcohol. Ensure they are dry before proceeding. 2. Apply a layer of base coat to each nail and let cure in the LED lamp for about 30 seconds per hand. 3. Follow the base coat with two coats of color gel polish. Cure with the lamp in between each layer. 4. Apply a thin layer of base coat which will serve as an adhesive for the confetti. 5. 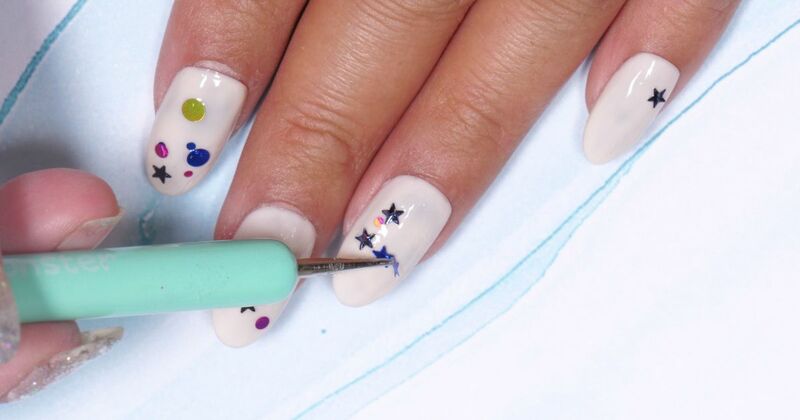 Using a nail art dotting pen, place each piece of flake confetti or glitter on the nail. Concentrate near the cuticle to create a falling effect. 6. Seal the nail art with a layer of glitter gel polish and cure in the lamp for about 30 seconds per hand. 7. Finish with a final application of top coat and let cure in the lamp for 1 minute per hand. Gently wipe each nail with rubbing alcohol to complete the manicure. Rub cuticle oil at the base for a professional shine.